Will they solve the crime in time to catch their plane? When The Mayor disappears and someone starts stealing important landmarks in Windy Mountain, two octogenarians become unlikely sleuths in this mystery with a big sense of humor. Thanks to a DNA test, the old men are also about to become unlikely tourists. ​​​​​​​​​​​This is the next book in the Windy Mountain Tasmanian Tiger series. But it stands up well on its own, and you don&apos;t need to have read the first two novels to get a load of laughs from this one. This time though the Tasmanian Tiger isn&apos;t the only one missing. IT IS A understatement to say that nothing is as it seems. Another raucous story from John Martin. THE two old codgers&apos; hilarious banter keeps the story moving at a funny pace. BLOKES ON A PLANE reads like a comedy sketch. It&apos;s quirky, heartwarming and funny . Start reading Blokes on a Plane (Windy Mountain Book 3) on your Kindle in under a minute. 4.0 out of 5 starsAussie John Martin Delivers Again! 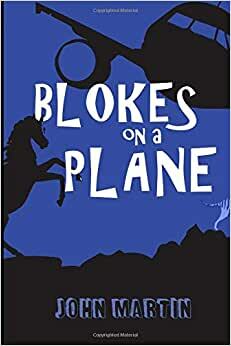 Blokes on a Plane is the third book in the Windy Mountain series and I was excited to find the “blokes” in question are two of my favorite characters from the first two books. Although young in the first book, Oodles and Wish-Wash are now two old codgers and their hilarious banter through Blokes keeps the story moving at a funny pace. While Oodles is a retired works foreman at the Windy Mountain Council, Wish-Wash was THE town drunk for thirteen years, setting standards too high for the ones that followed. The fun begins when Wish-Wash wins a contest to fly to Donegal, home of his ancestors and decides to take Oodles with him. Before the trip, strange things begin happening in town and the two old men turn into amateur detectives, trying to solve the disappearances of an ex-mayor, town signs, town bench and the big bronze statue of Colonel Northan from the middle of the street. What ensues is a crazy story that includes a lesson in the death of print newspapers (along with fake news), the continued hunt for the Tasmanian Tiger (Oodles and Wish-Wash are now the owners of the Windy Mountain Tasmanian Tiger Museum) and Wish-Wash’s outrageous, mismatched outfits (can you say “fashion train wreck”). Will the “blokes” actually get on the plane? Join Oodles and Wish-Wash to find out in another Windy Mountain story that is guaranteed to make you smile. Blokes on a plane reads like a comedy sketch. It's something a little different for me and it was entertaining. It's about an elderly community in a small town, Windy Mountain. It's quirky, heartwarming and funny to read about these two troublemakers. You are as old as you feel and these two are young at heart. Oodles and Wish-wash live in Australia. They are planning a holiday to Ireland but first, they need to find out what happened to the old Mayor. He has gone missing. What starts as a little detective work turns into a whole lot of mess for these two. Will they ever get their break? 4 stars out of 5. Something different. Two elderly residents of Windy Hill take it upon themselves to solve a series of mysteries that no one seems to have noticed. Oodles, a noon (reckless driver) and Wish-Wash, former town drunk, have settled down and established a Tasmanian tiger museum but their lives changes when Oodles wins a trip for two Ireland based on his DNA. Who else to take but Wish-Wash who has never traveled. Wish-Wash has noticed items and persons missing and a formidable new resident who seems to be involved in the mysteries. The two humorously delve into the mysteries and involve the odd characters that inhabit Windy Mountain. It is a understatement to say that nothing is as it seems. Another raucous story from John Martin.